Conventional wisdom holds that trade liberalisation benefits all countries, though not necessarily equally. Within countries, however, while most individuals stand to gain from trade, some might lose out, in particular those workers whose jobs are displaced by trade liberalisation (Lawrence 2014). The recognition that trade liberalisation might hurt some workers led the US Congress to establish the Trade Adjustment Assistance (TAA) programme under the 1962 Trade Act authorising the US to participate in the Kennedy Round of multilateral trade negotiations. Initially meant to provide income support to workers losing their jobs as a result of the negotiations, the TAA programme was amended in 1974 to aid all workers negatively affected by increased imports, and has remained in operation ever since. For a long time, no such programme existed at the EU level – because EU member states typically have much more generous welfare systems than the US and are therefore better able to cope with the ‘pains from trade’. With the European Globalisation Adjustment Fund (EGF), established in 2007, the EU got an instrument broadly comparable to the TAA programme. The EGF provides financial assistance to facilitate the re-integration into employment of workers who have lost their jobs as a result of globalisation. The creation of the EGF was a political acknowledgment that the EU, which has exclusive competence over trade policy, should assume some budgetary responsibility for the economic displacement that globalisation entails. Since the money involved in EGF programmes only amounts to a tiny fraction of social expenditures by EU member states, it was recognised from the start that EGF programmes needed to be both politically visible and economically sensible. In the context of the current negotiations on the post-2020 Multiannual Financial Framework (MFF), in a recent paper we evaluate the EGF programme after ten years of activity and make recommendations on how to improve it (Claeys and Sapir 2018). The EGF’s original objective was to co-finance – together with national authorities in charge of implementing programmes at the local level – policies to help workers negatively affected by globalisation find new jobs. The co-funding rate has changed several times since the creation of the Fund, but the EGF share has been 60% since 2014. Given their contingent nature, there is no precise commitment for EGF expenditures in the MFF. The Framework only defines an annual cap, which was originally €500 million per year for the 2007-13 budgetary cycle. This cap was reduced to €150 million per year for the 2014-20 MFF, amounting to roughly 0.1% of the EU budget, which itself equals about 1% of the EU’s GDP. In terms of procedures, applications need to fulfil three basic requirements to be eligible for EGF financing. First, redundancies must result from globalisation, defined as a substantial increase in imports into the EU, a serious shift in EU trade of goods or services, a rapid decline of the EU’s market share in a given sector, or the offshoring of activities to non-EU countries. In 2009, the scope of the EGF programme was enlarged to redundancies resulting from “the global financial and economic crisis”. When the EGF was revised again in 2013, it was decided that the scope of the programme would continue to cover situations arising from the “continuation of the global financial and economic crisis… or as a result of a new global financial and economic crisis”. Second, applications must concern a fairly large minimum number of workers. The original number was 1,000 redundancies in a particular firm or in a group of SMEs located in one or two contiguous regions. The threshold was reduced to 500 in 2009. Though not a stated objective, political visibility seems therefore to be an obvious goal of the EGF. Third, EGF applications must exclusively finance active labour market measures to re-train and re-employ redundant workers. Between 2007 and 2016, 147 applications to the EGF – covering 140,545 redundant workers – were approved. The total number of workers who actually benefitted from EGF financing was about 20% less than the number of eligible workers, because some of these workers had already found a new job by the time their EGF application was funded. 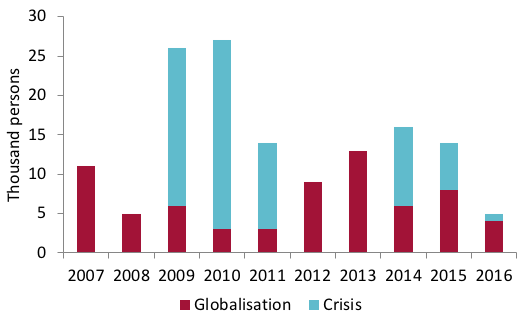 Although originally designed to deal with the consequences of globalisation, the EGF has actually been used more often to deal with redundancies caused by the crisis – 52% of cases, covering 51% of the redundant workers and awarded 55% of the funding, related to the crisis fallout rather than globalisation. 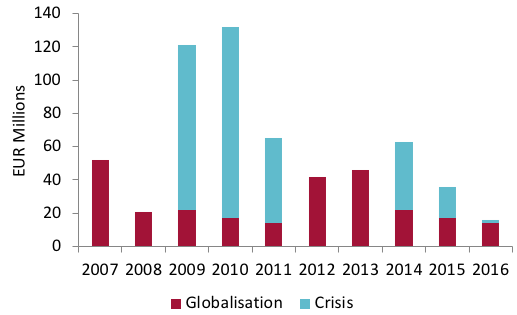 Figure 1 gives the total number of targeted workers and the total funding committed under the EGF, broken down between ‘globalisation’ and ‘crisis’ for each year from 2007 to 2016. The maximum amount of funding awarded by the EGF in any year was €132 million in 2010 (€115 million for the crisis and only €17 million for globalisation), which explains why the annual EGF envelope was lowered from €500 million to €150 million in 2013. The average amount of EGF funding awarded per worker over the period 2007-16 was €4,219. Given that over the period, the average share of co-financing provided by member states was 42%, it means that each redundant worker eligible under the EGF received on average €7,274 in active labour market services, a fairly substantial amount. We find that the programme was highly politically visible, in the sense that EGF beneficiaries tended to work in large firms prior to their dismissal and that these dismissals were largely reported in the media. But it is also essential that services financed by the EGF really do make it more likely beneficiaries will find another job. Unfortunately, the economic effectiveness of the EGF programme is more difficult to evaluate, mainly because the available data are insufficient. Our estimates, however, suggest that only a small proportion of EU workers who lost their job because of globalisation received EGF financing. Sadly, it is impossible at this time to assess whether workers who received EGF assistance did better in their job search than those who did not receive EGF assistance. We thus make three recommendations to improve the EGF programme. First, there is a need to improve the monitoring of the programme by collecting more and better data. The present situation is clearly unsatisfactory because it does not allow a proper evaluation of the EGF. The best approach would be to collect data at the individual level and not only at the case level. At the very least, reports on each EGF case should be made available and should be standardised in terms of measures undertaken and outcomes. This would have the additional advantage of making cases comparable so that member states could share good practices. Second, there is a need to revise the rules of the programme to increase its use, in three ways. First, one should envisage having no threshold (like the TAA) or at least a much lower threshold. Obviously, this would imply that the amount of money needed for the programme would increase significantly (to around €800 million per year for globalisation cases only, according to our calculations), but it would also mean greater equity between workers of large establishments, who tend to be eligible, and those from relatively small companies who tend to be excluded, unless they are geographically concentrated. Second, the co-funding rate could be changed and be made equal to the one used for programmes financed by the European Social Fund (ESF). This would remove the disincentive to use the EGF by low-income countries, where the national co-funding rate for the EGF is higher than for the ESF. Third, the European Commission could be more proactive in its management of the EGF. It could, for instance, use Eurofound’s European Restructuring Monitor database, which provides data on large-scale restructuring events reported by the media, to detect redundancy plans meeting EGF eligibility criteria and to suggest to national authorities that they could apply to EGF programmes for these cases. Finally, the scope of assistance should be enlarged from globalisation to other policy-induced sources of adjustment, including intra-EU trade and offshoring, and the phasing out of activities to reduce carbon emissions (Tagliapetra 2017). Our findings suggest that increasing the scope to intra-EU offshoring and reducing the threshold to 100 redundancies could result in several hundred additional EGF cases. The EGF could therefore become the EAF, the European Adjustment Fund, with expanded resources. Ideally these resources should be included in the MFF through the creation of a specific budget line (which would also have the advantage of speeding up the procedure). Claeys, G, and A Sapir (2018), “The European Globalisation Adjustment Fund: Easing the Pain from Trade?” Bruegel Policy Contribution No 2018/5. European Commission (2018), “Summary of EGF applications – 2007 to date (Monthly update)”, DG-Employment website. Lawrence, R Z (2014), “Adjustment Challenges for US Workers”, in F Bergsten, G C Hufbauer, and S Milner (eds. ), Bridging the Pacific: Toward Free Trade and Investment between China and the United States, Peterson Institute for International Economics: Washington, D.C.
Tagliapietra, S (2017), “Beyond coal: facilitating the transition in Europe”, Bruegel Policy Brief, issue 5.